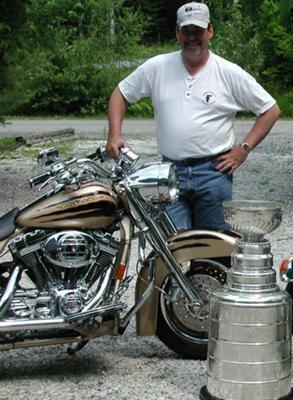 Pat Burns with the Stanley Cup and his Harley. His two passions. Pat Burns had 2 passions: hockey and motorcycles. This is why, when Jean Pagé had the idea of a motorcycle event to raise funds for prostate cancer research, he immediately thought of honouring Pat Burns memory and the incredible courage Pat showed during his own fight against cancer. Date: Saturday June 18, 2011, Father?s Day weekend. Departures from everywhere in the province: Gatineau, Montreal, Trois-Rivières, etc. The team that has raised the most funds will take home the Pat Burns Cup.